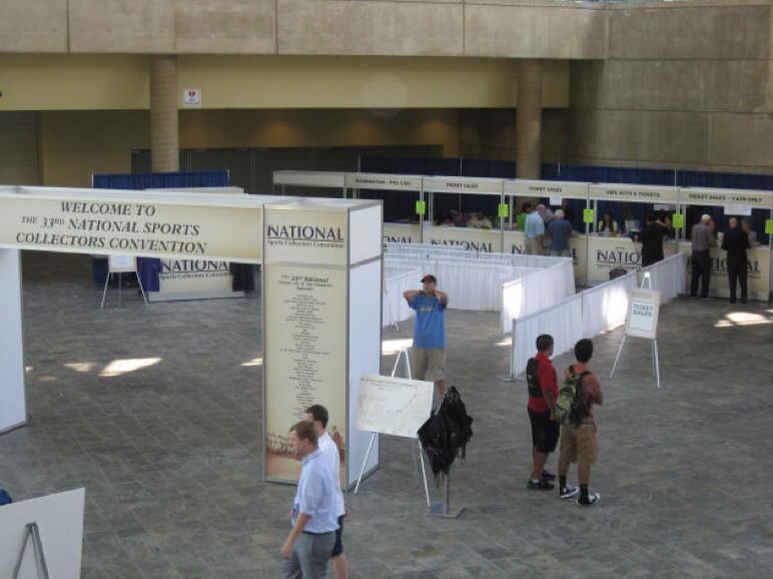 Day Two at the National is the first full day and the first day In general for many, so in some respects collectors are still getting their feet wet. 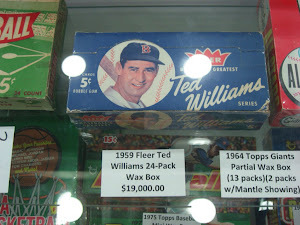 But today was dominated by Topps. 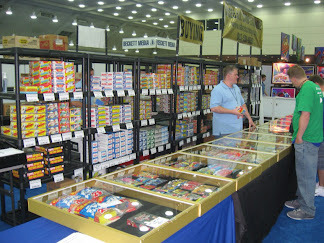 Again their allotment of wrapper redemption cards were gone early in the day. All Bowman Blue Foil sets were claimed within 45 minutes and the GQ minis were gone in 2 hours. But baseball is not the only thing going on at Topps. 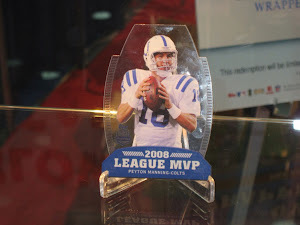 On display were cards from the upcoming release of 2012 Topps Football. These cards look great in person, but probably the most impressive would be the clear acetate die cut cards. Topps has done a great job with these. 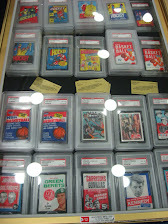 A nice surprise was seeing a good amount of space devoted to a Topps non-sports release. 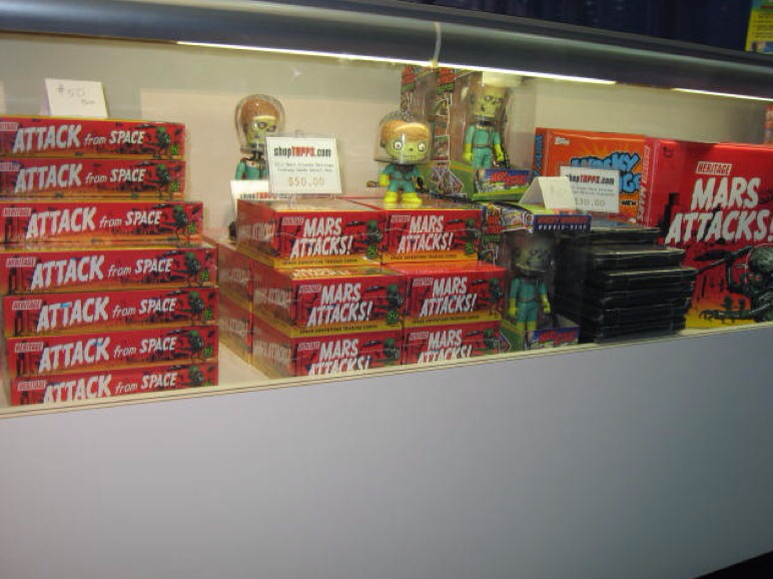 Mars Attacks cards were drawing a lot of attention. Perhaps this display helped. 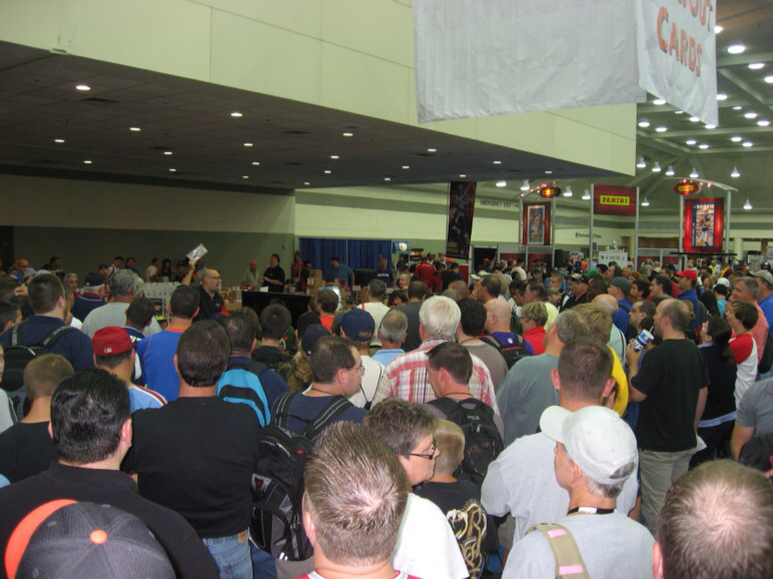 Topps also had their Meet and Greet at the end of the day, but that is deserving of an entirely separate post, more on that later. 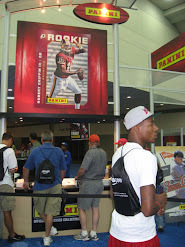 Directly across from the Topps booth is Blowout Cards. Boxes of cards were being briskly sold. 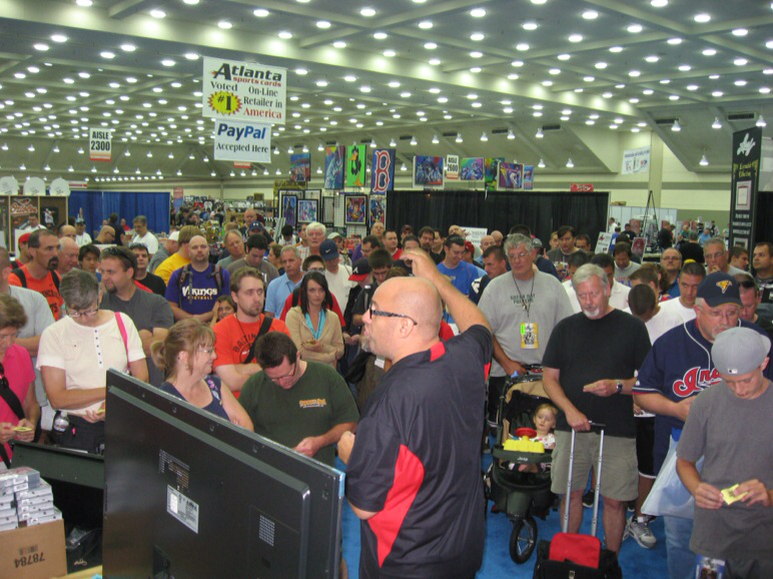 But things really got hopping at 3:00PM when the owner of Blowout Cards, Tom Fish, started their free daily raffle. They were giving away box, after box of product to several lucky winners. 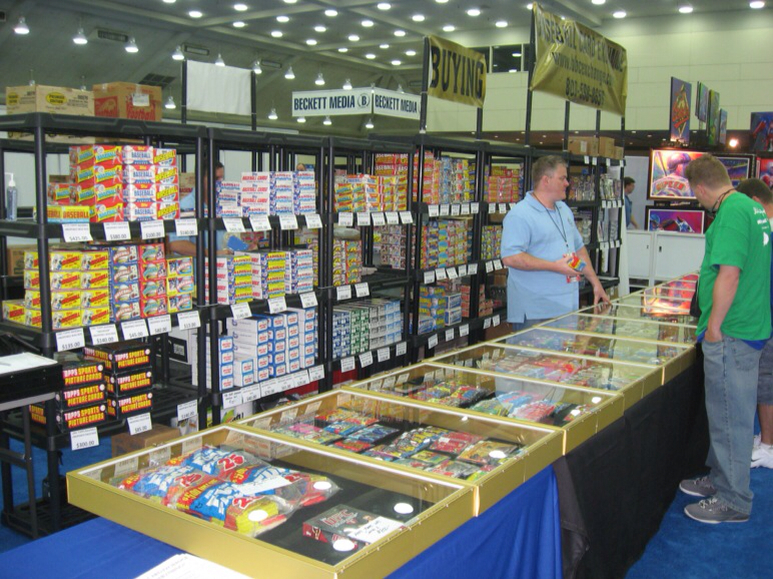 It was great to see a kid, who must have been around ten, walk away with 8 boxes of cards. The largest prize was a whole sealed case. If you are in Baltimore, make sure you get your free raffle ticket and show up at the Blowout Cards booth by 3PM. Your ticket is good for the entire run of the show. 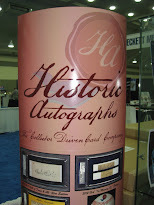 While you are there, you might want to take a shot at picking you a box of Historic Autographs Legends of the Hall. 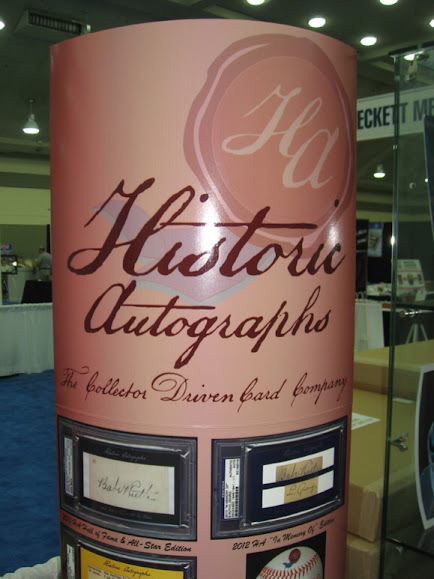 Each box contains one signed item from a Baseball Hall of Famer and if you take your box to the Historic Autographs booth they will give you an additional autograph, 2 for the price of 1. In addition to their promotion, they were providing an advanced look at their upcoming product, "Why The Hall Not" a set devoted to players who haven't made it to the Hall and are the topic of a lot of discussion as to whether or not they should be in the Hall. 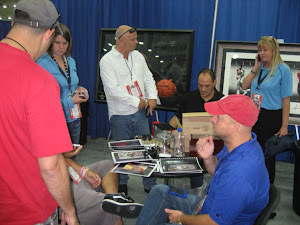 Case in point, Pete Rose and Shoeless Joe Jackson. 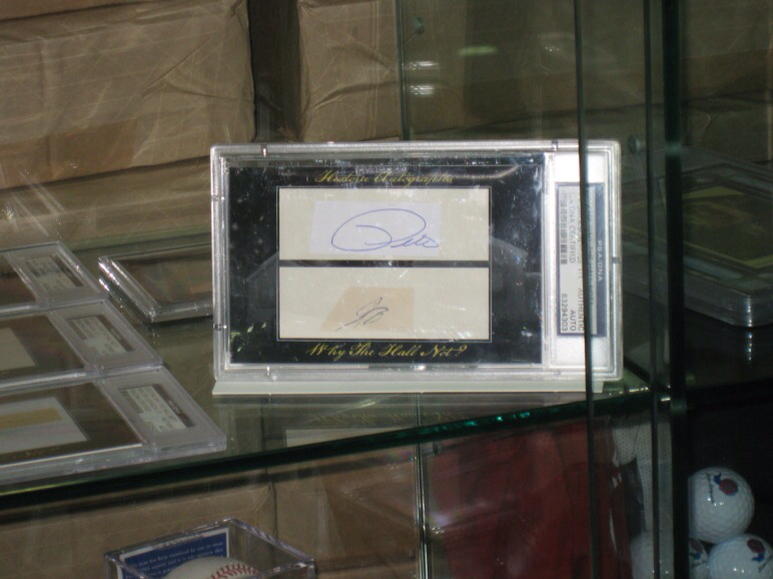 That is a first name only, dual cut signature card of Rose and Jackson. There will only be 3,000 of these boxes made. 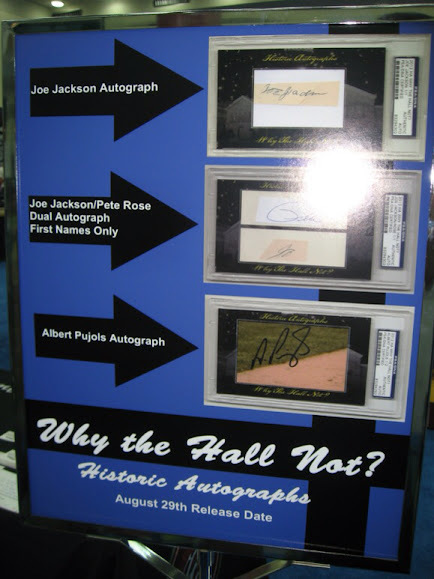 There will also be a full Joe Jackson Cut Auto along with many others. Right near Historic Autographs is Baseball Card Exchange. They deal exclusively with unopened boxes and packs of cards from previous years. 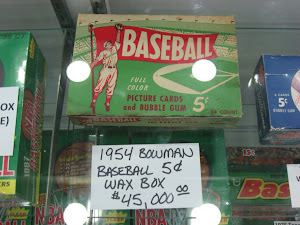 There is often a discussion amongst collectors about what the cut off year is for a card to be considered vintage. Looking at these loose packs of Topps Baseball gives you a good idea based on price alone. 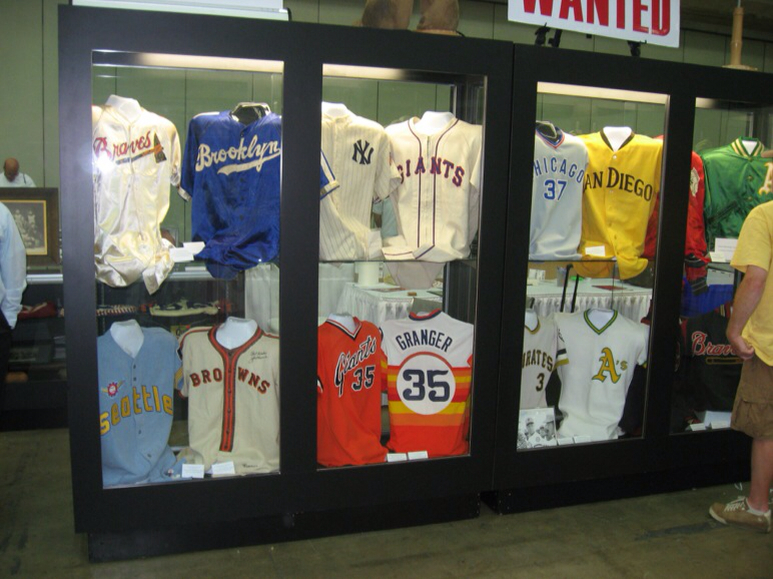 The prices are as follows - 1972=$275, 1973=130, 1976=$65, 1977=$32, 1978=$22, 1979=$12, 1981=$3. 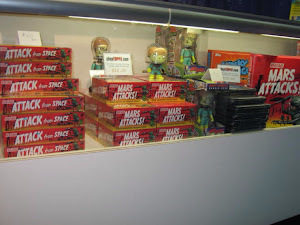 Here are some other premium items they had on display. 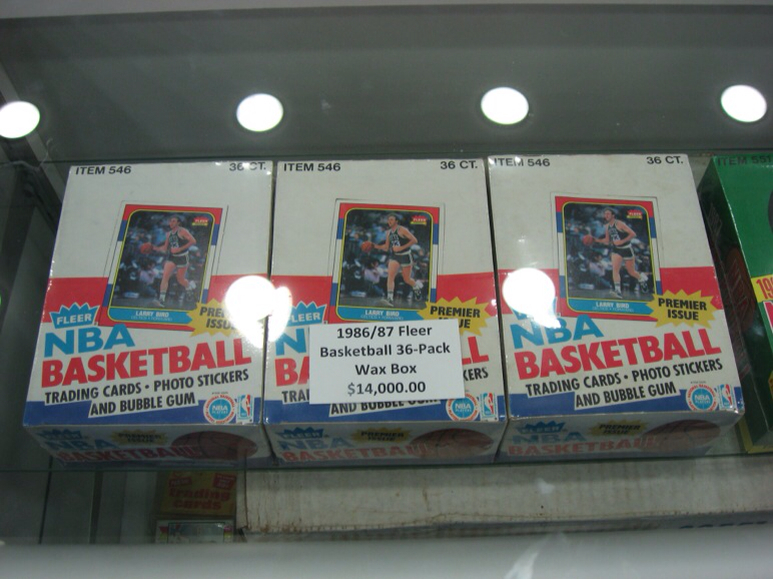 1986/87 Fleer Basketball, which contains Michael Jordan's rookie card, priced at $14,000. 1959 Fleer Ted Williams cards priced at $19,000. 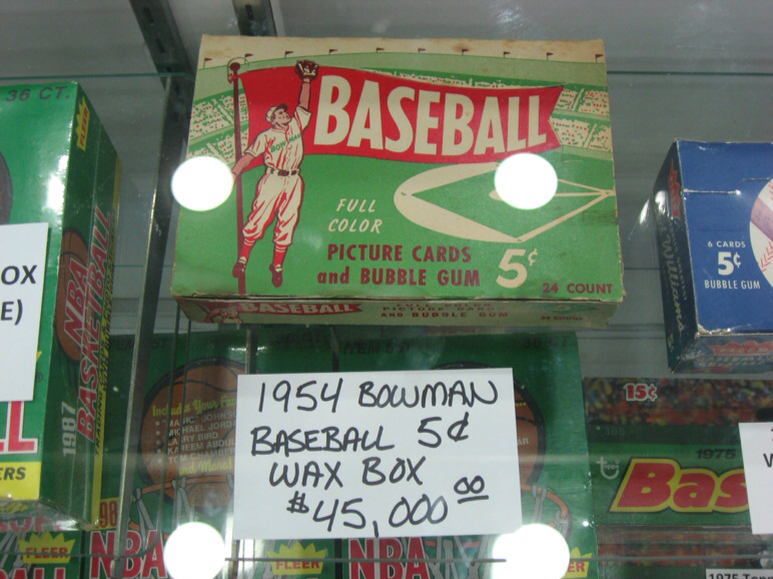 A box of 1954 Bowman Baseball priced at $45,000. By the way, the box is no longer available, someone bought it. 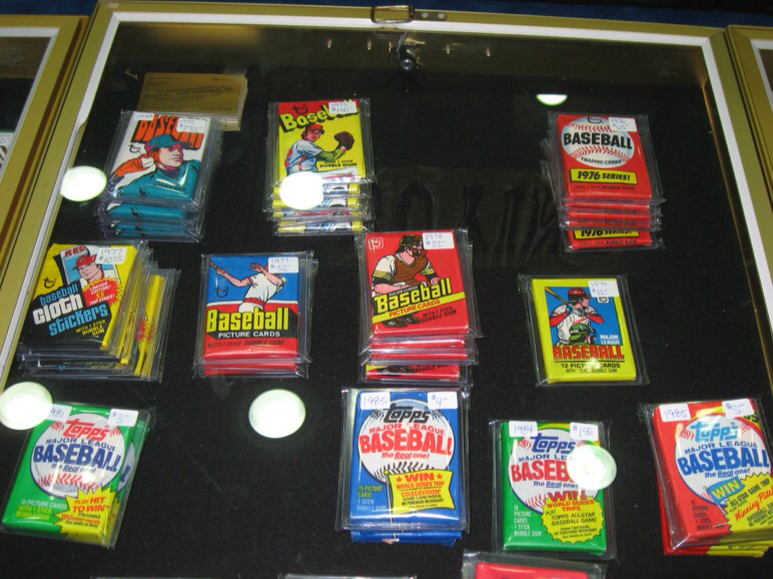 Baseball Card Exchange also has graded unopened packs. 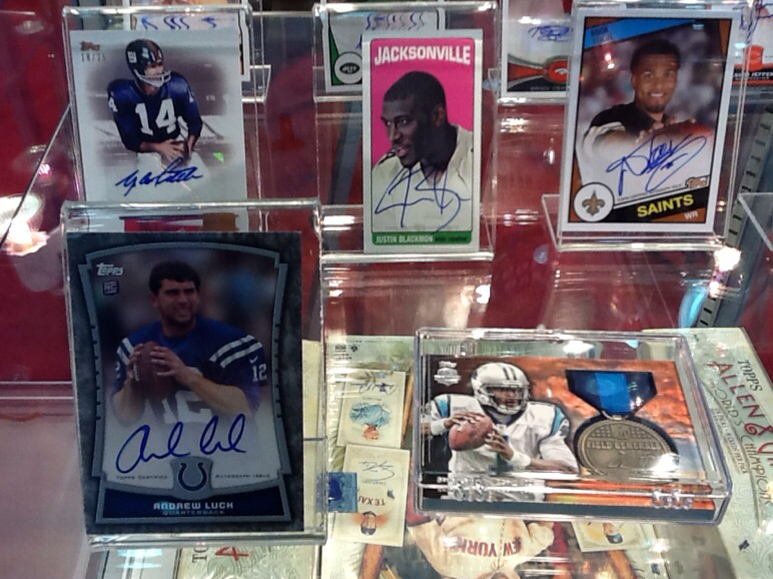 Today Upper Deck's wrapper redemption program was in full swing. 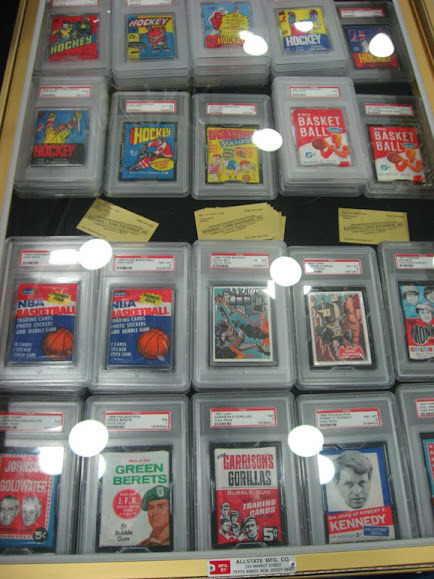 There were collectors that were doing small amounts of packs, all the way up to multi case breaks of Exquisite. But it didn't take busting a case to pull a big hit. One of the redemption packs yielded this card. 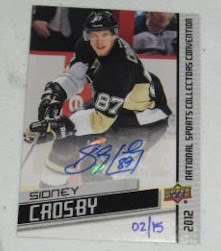 A Sidney Crosby autograph #/15. Panini's wrapper redemption program was still going strong. The line to get packs was over 100 collectors deep. 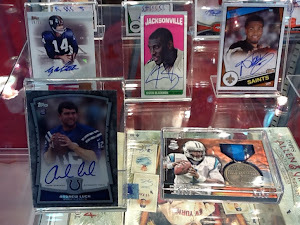 Most collectors I talked to were hoping to pull an Andrew Luck auto and there was also interest in the packaging box printing plates. 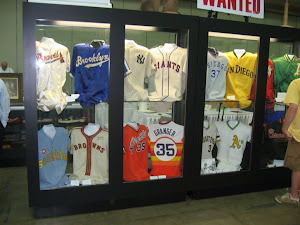 There is an abundance of game used jerseys here at the National. The items pictured above may not have been worn by the most famous of players of the game, but they are great looking. 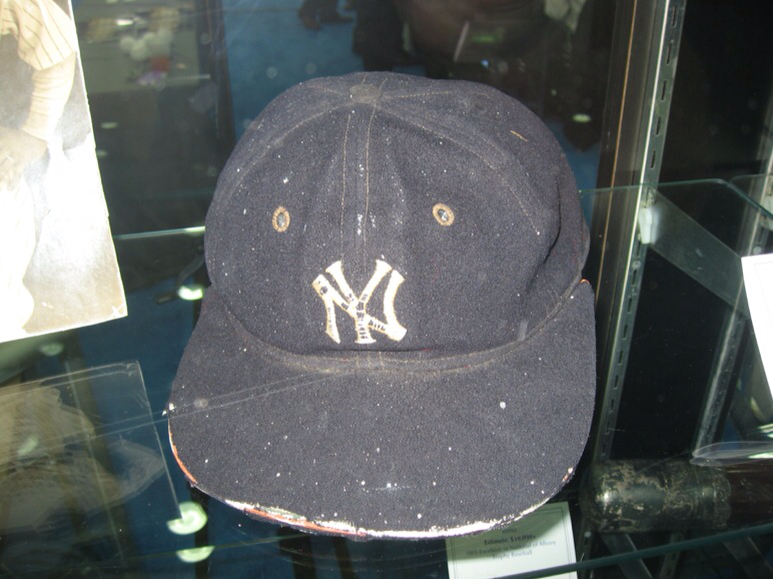 But, of course, there are the game used items from the legends of the game, like this Babe Ruth Yankees Cap. 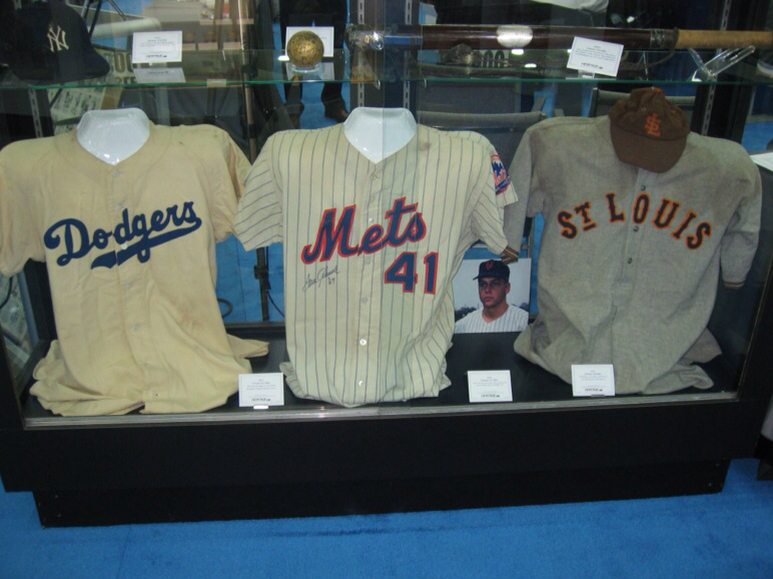 This trio is from Gil Hodges, Tom Seaver and Rogers Hornsby, all a part of Heritage Auctions' items. 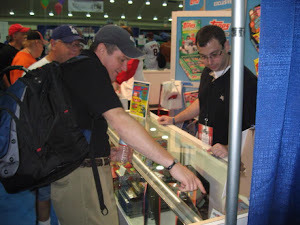 One of the interesting booths that was not card or memorabilia related was Fantasy Player Exchange. This brand new startup is a fantasy sports website that adds Wall Street type elements to their leagues. Players are exchanged and rated like stocks with values that go up and down based on performance. By assigning these values it allows for athletes from almost every sport to be used. For a more in depth explanation of how it works, check out their site. Beyond the items available at the National, I spent a lot of my time talking to different collectors about what they are looking to pull and what brings them to the National. I met a great father and son duo who live very near to where I do in California. They came to the National to look at vintage items. 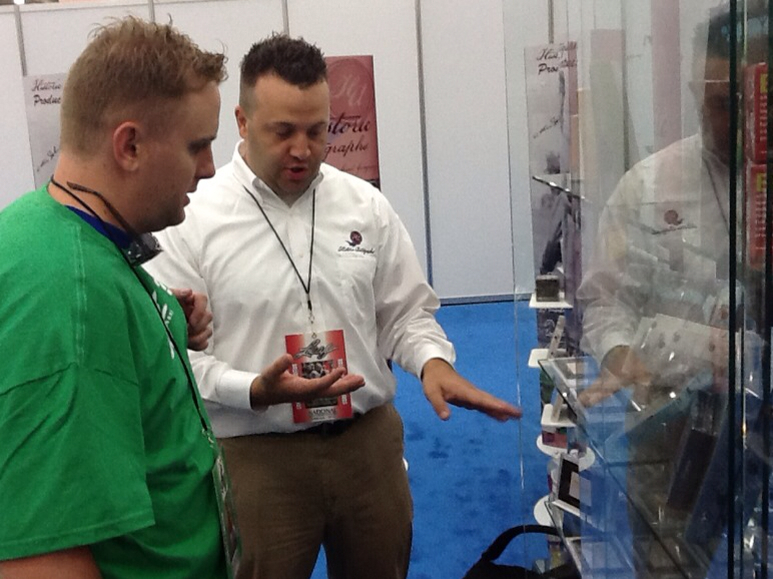 It keys them into memories of shared sports experiences. They love the social aspect of meeting different collectors and dealers who have their stories to share. 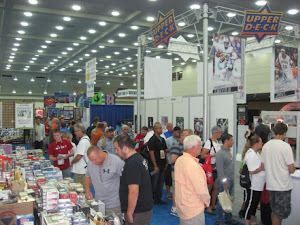 Tomorrow, Day 3, is the kickoff of the heavy hitters at the autograph pavilion, so that area should start buzzing. Cardboard Connection Radio will be broadcasting live from the floor. 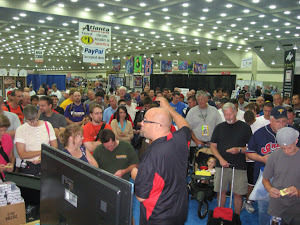 After show hours there is the Steiner Sports party and the Freedom Card Board get together. That will do it for this recap. 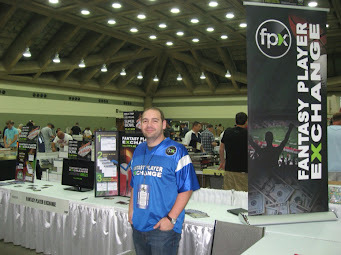 Make sure to look for a recap of the Topps meet and great along with another nightly recap tomorrow. Good night from Baltimore. great photos! what has the general atmosphere been like besides insanely busy?